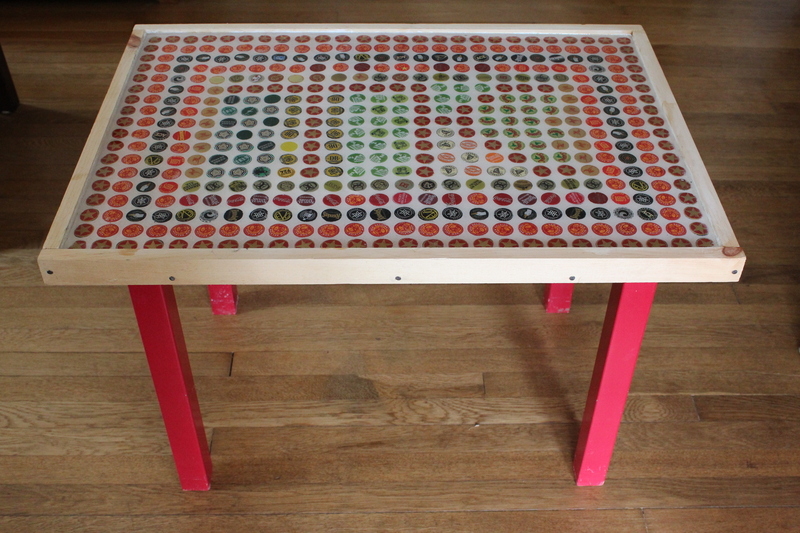 How to Make an Upcycled Bottle Cap Table! 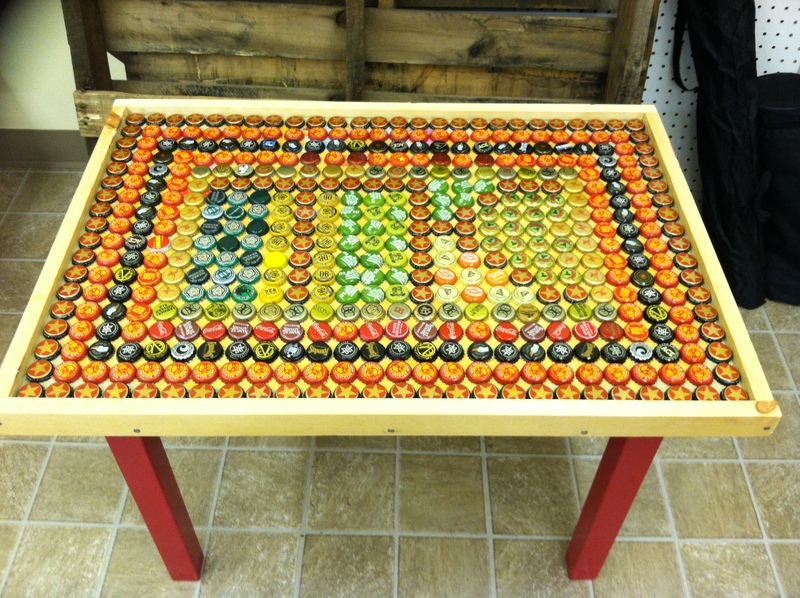 My husband has been saving bottle caps for as long as I’ve known him, saying that someday he planned to make something out of them. 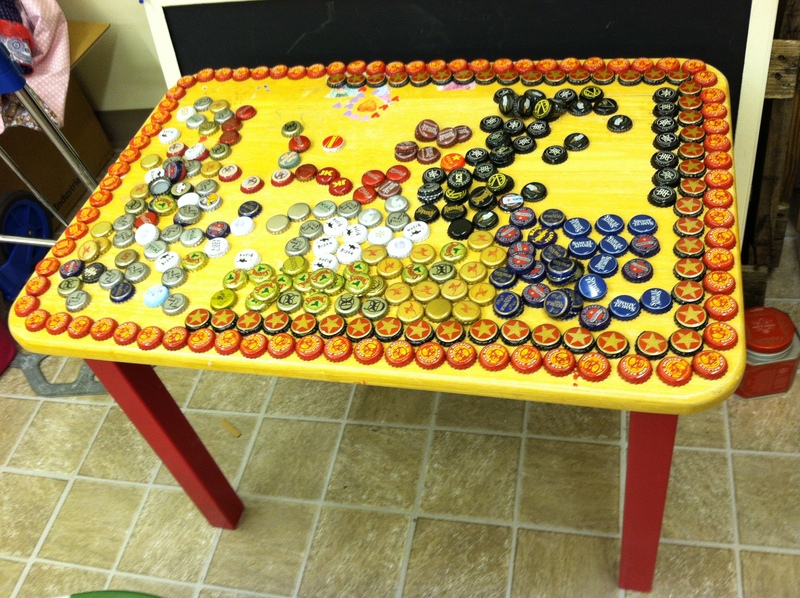 He wasn’t sure what it would be, and the bottle caps kept accumulating. Inspired by the colorful collection, I decided to turn them into a practical gift for him. And given the volume of caps, I thought it would be good to make something that used A LOT of them! 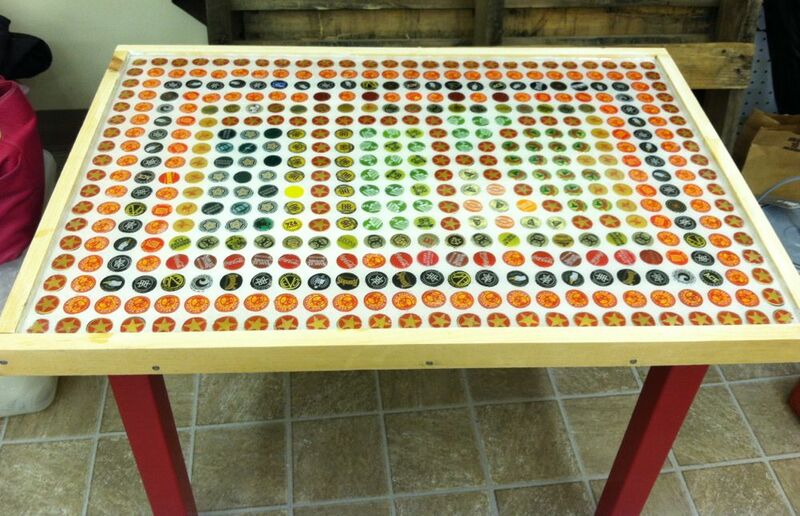 In combing through Pinterest, I found lots of bottle cap craft inspiration. 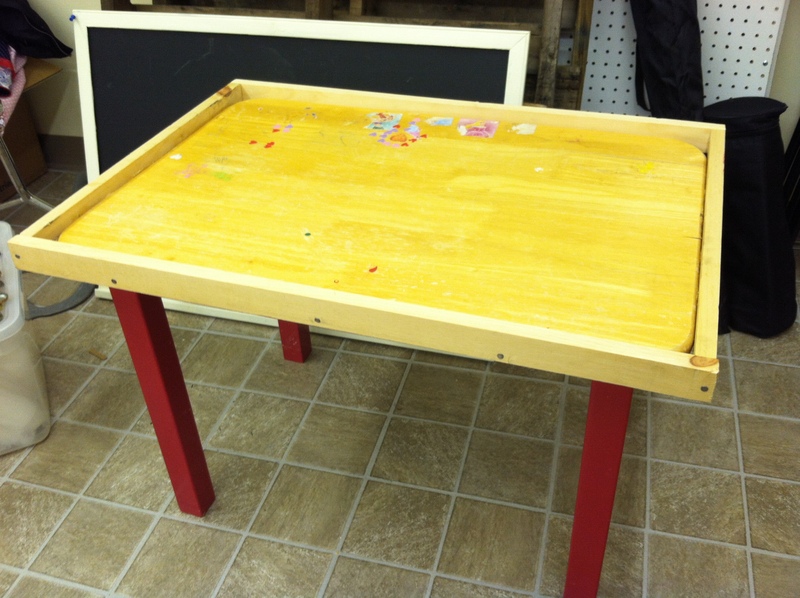 The ones that used the most were tables, so that’s what I set off to make for him. I found a sturdy, basic little table at a local thrift shop. It had a cluster of tiny princess and heart stickers stuck to the top, which I decided to just leave since I didn’t require a perfectly smooth surface. I started by separating the caps by color, then laying them out to see what type of pattern I could make given the colors and quantities I had. 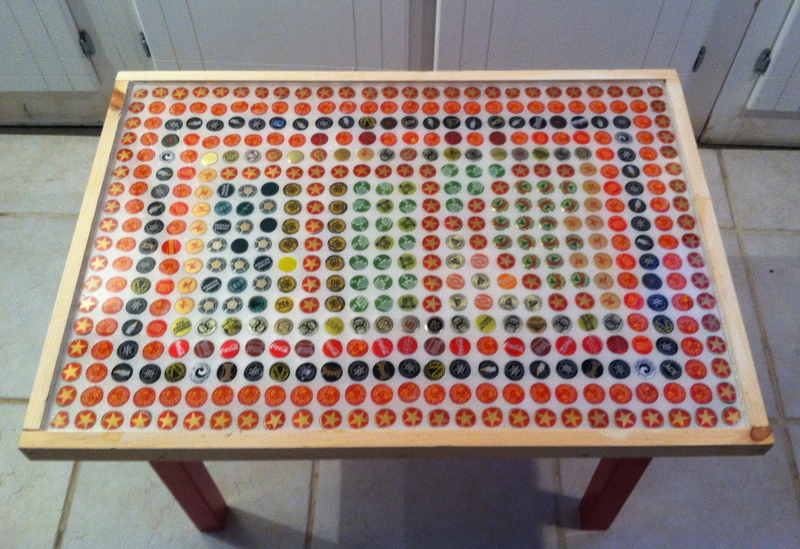 Once I figured it out, I removed the caps, placing them in cups by color. In order to make the grouting and lacquering easier, I added a rim to the edge of the table by nailing on some 1″x2″s that I had cut to size. Because the table had rounded edges, and I am not skilled or patient enough to cut the trim to fit, there was a gap that had to be filled. 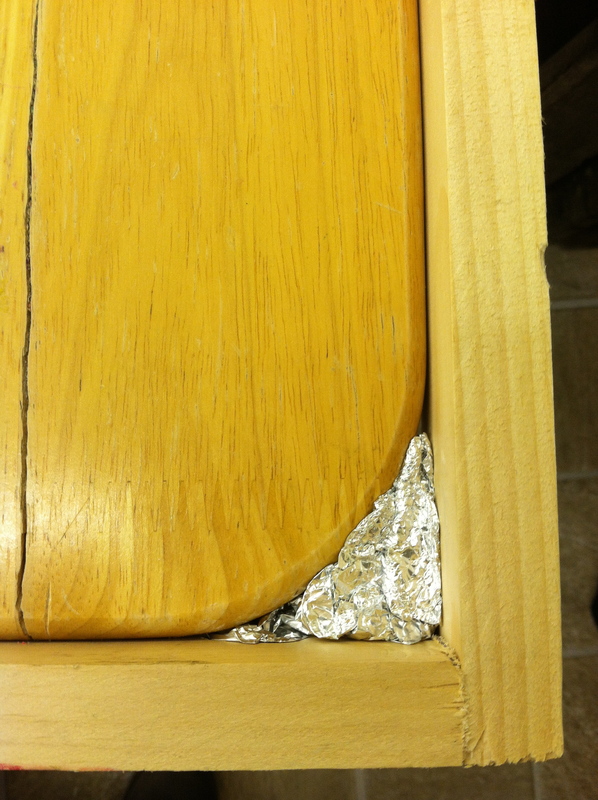 I improvised by stuffing in some tightly wadded aluminum foil into the corner to fill in the space. Then I filled in all of the gaps with wood filler to prevent any grout or lacquer from seeping through. 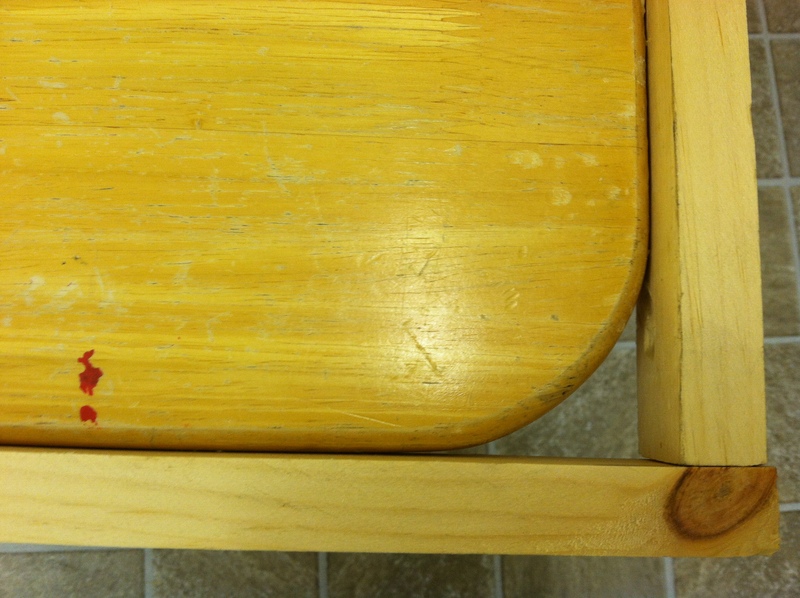 Once the wood filler was dry, I sanded it and removed any loose pieces. Next, I glued the caps into place starting from the outside. I used Gorilla Glue, which worked well. It provides a strong hold, but doesn’t dry instantly, so you can adjust the caps as you work. You don’t need to use a lot per cap, just a few drops. Once I had glued down all of the caps, I let it dry overnight. The instructions say it is 80% dry in 2 hours, but fully cured in 24. Next, I grouted the caps to give it a tiled effect. 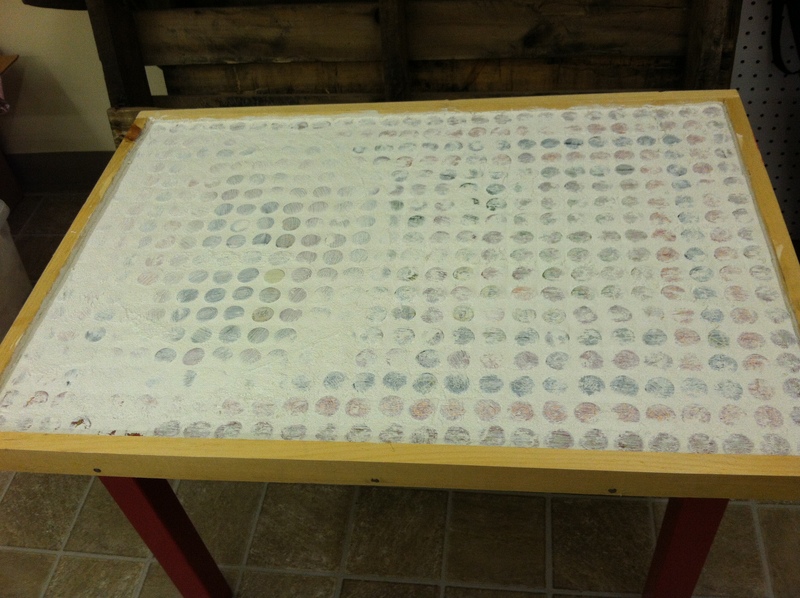 Using a grout float, I carefully worked the grout in and around the bottle caps, making sure there were no gaps. I then used the float to smooth the top to make it even and to the point where the caps were just visible. 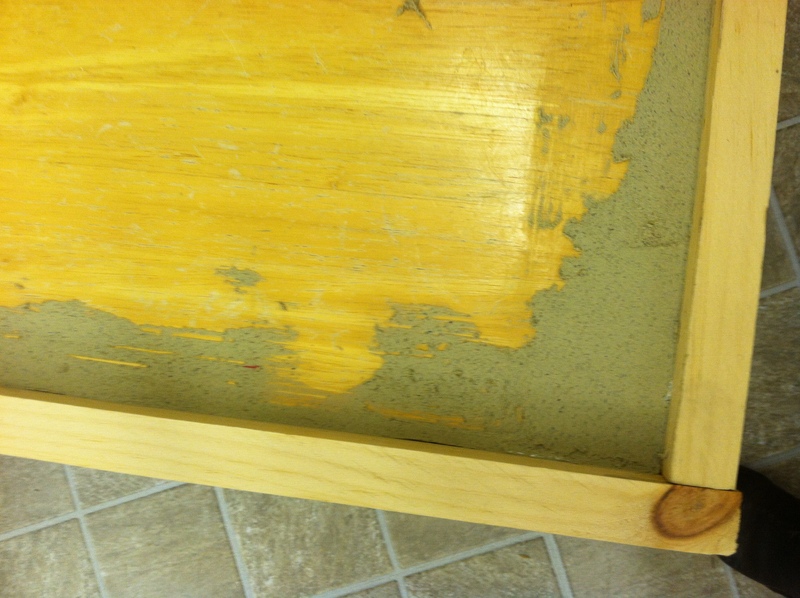 I then used the dampened sponge to wipe across the grout until the bottle caps were visible and the grout was even. It took a lot longer, and required more patience than I had anticipated! I then let it sit for 24 hours. Finally, I covered the entire surface with epoxy resin, making sure to fill in all gaps. I again let it sit overnight. While not perfect, I was very happy with the results! Here is our interview with Etsy artist Beth Hess of Wunder Around. She will be demo’ing how to make terrariums using her handblown glass vases at our Small Business Saturday event, which takes place Saturday, November 29 from noon to 4pm at our Merrifield Store. When did you start your line and why? 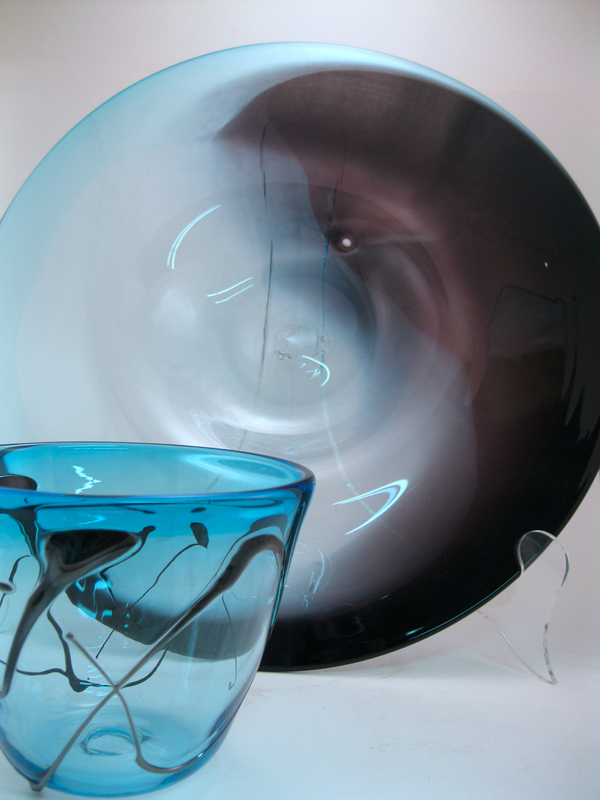 I enjoy making colorful, functional pieces of blown glass that can be used (and enjoyed) everyday. I’m well into year two of my Threads Collections. These are highly touchable pieces with lots of texture. I started making white vases with various colors of “thread” on the outside and the collection has grown from there. I started my Duos Collection last year after returning from a trip to Iceland. The colors I saw there just begged to be recreated in glass. I started the Duos Collection to capture the intensity and juxtaposition of colors that I saw, and continue to find new color combinations around me everyday. I’ve always been a crafter and I love to experiment with new mediums and techniques. 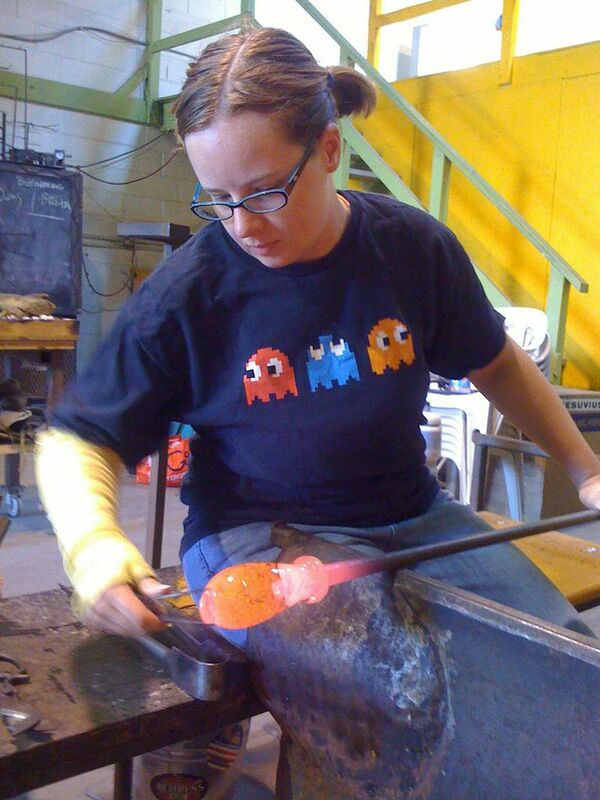 I took my first glassblowing class five years ago in June and fell in love with it. My professional background is in communications and I spent more than a decade helping nonprofits and businesses tell their story. Doing it all. I enjoy things like making signage and updating my website in addition to the actual making. Doing it all. There’s always more that I could be doing, so prioritizing and making the best use of my time is a constant battle; along with keeping up with things like bookkeeping. Color and the challenge of transforming 2,080 degree clear glass into something else entirely. Each color behaves differently as you’re working with it. I love the challenge of making an idea a reality in glass, the process of working with the glass itself and seeing what happens when light passes through the results. Where do you see your line going from here? I’ve been working for a while now with two-colors in each piece and recently started adding a third, and working on some new shapes to highlight them. I don’t know yet where it all will go, but am enjoying the process. 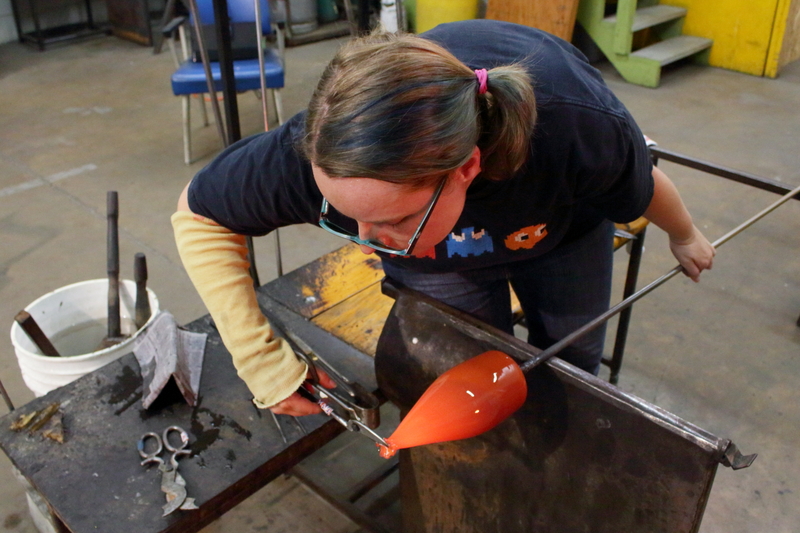 I love making colorful, beautiful pieces of blown glass that help make your everyday feel special. Handmade by Beth Hess, each piece of Wunder Around glass is built layer by layer with heat & air, starting with a gather of clear glass from a 2,080° furnace in Hyattsville, Maryland. I think the stuff of everyday life can be special—from the glass you drink your morning juice in, to the bowl that collects your junk mail. And that having a fabulous vase to put flowers in is a great excuse to bring some home, to surprise your coworker or say thank you to your mom. 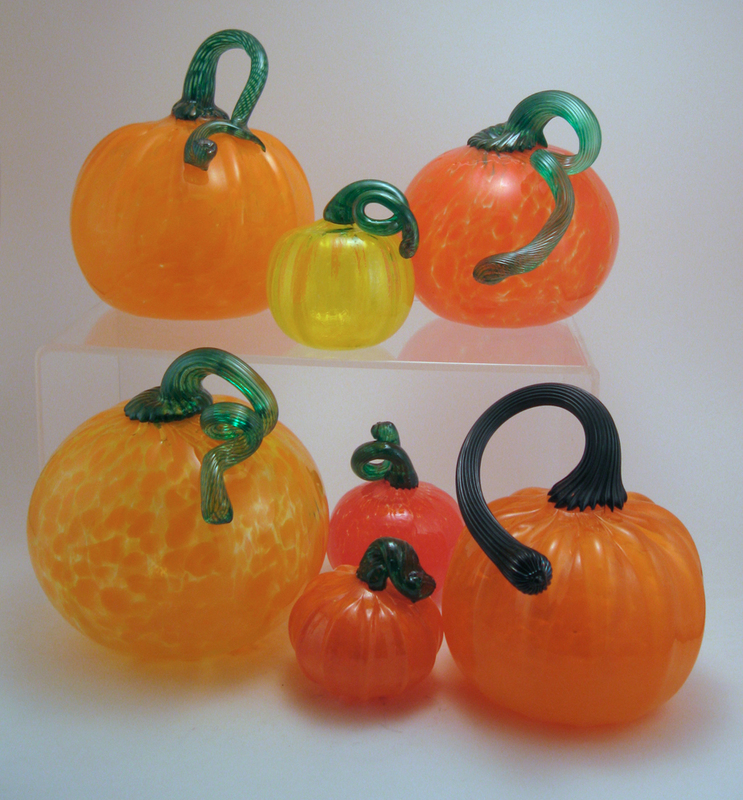 My seasonal offerings include blown glass pumpkins, which make a great addition to your mantel or table, and colorful blown glass ornaments add handmade sparkle to your tree year after year. 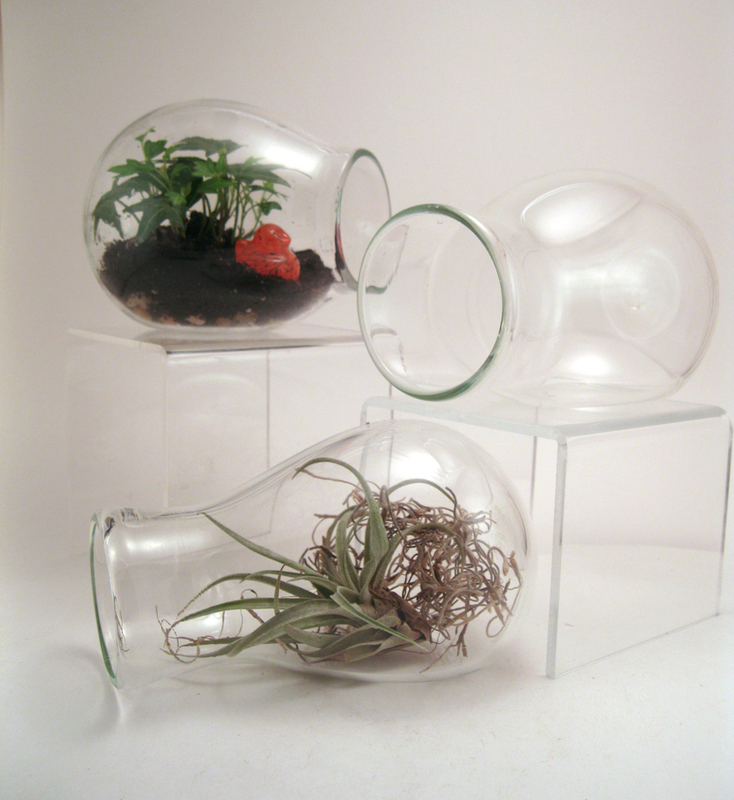 New for Fall 2014, I have created handmade terrariums feature clear glass and clean lines. 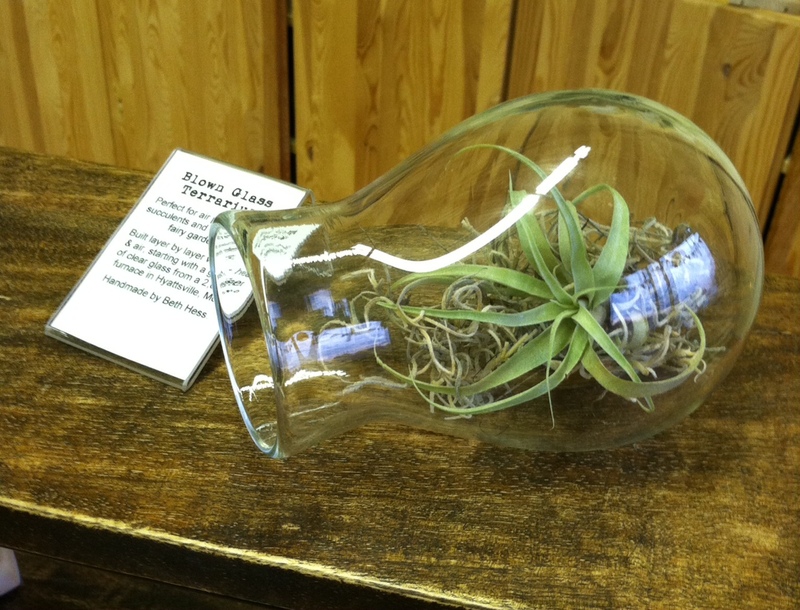 They are great for air plants, small plants and the tiniest of fairy gardens. You can find more about Beth’s products and process at her website, Etsy store, Twitter, Instagram and Facebook pages!